How well do you know your fashion history? Do you know your appliqué from your tambour, and your Dior from your Emanuel? Test your fashion knowledge below and share your score. What year is this pink dress by Christopher Kane? 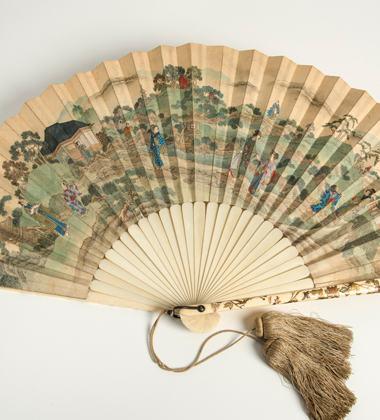 What material is this 1800s Japanese fan made from? 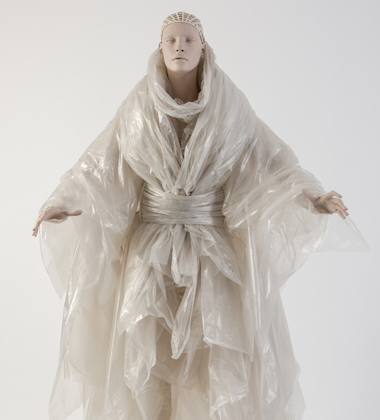 Gareth Pugh created this plastic wrapped ensemble in 2014. Where was he born? 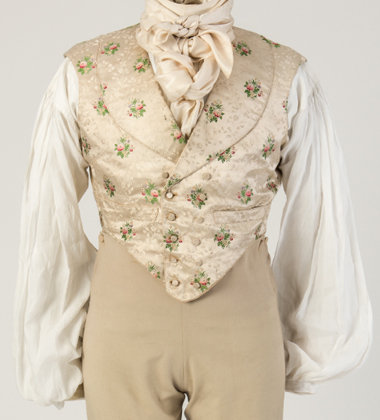 Which era is this man's outfit from? 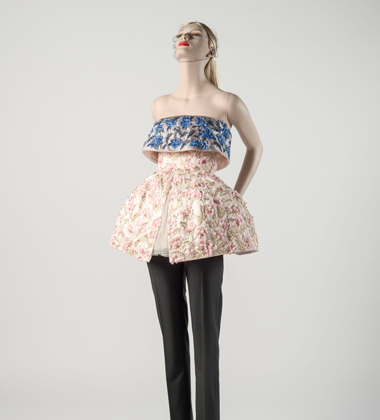 What kind of embroidery did the House of Dior use on this ensemble in 2012? 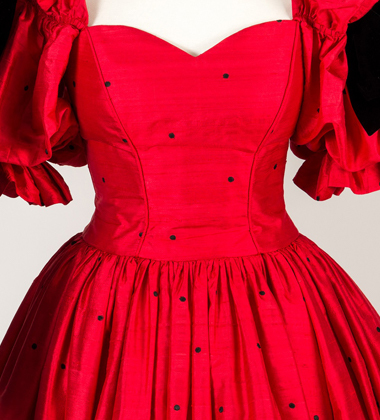 The Emanuels designed this ballgown in the 80s, but whose royal wedding dress did they design? 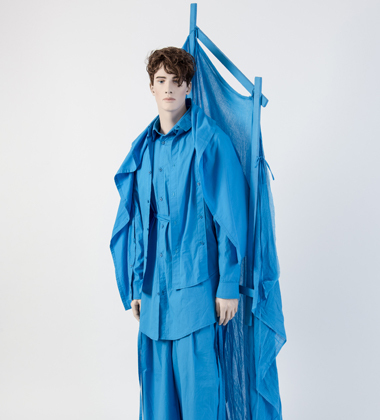 Which designer won the Fashion Museum’s Dress of the Year 2015 with this blue cotton ensemble? 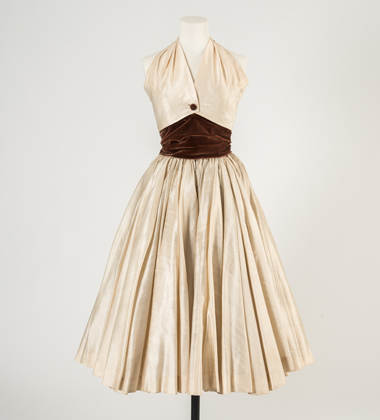 In which decade did Christian Dior design this cream slub silk halter neck dress? 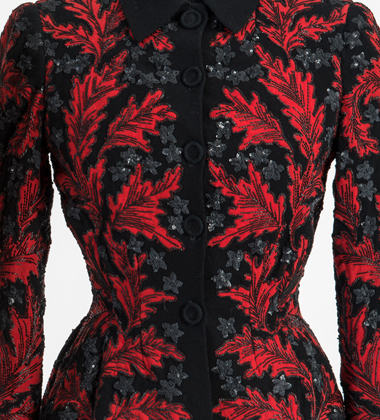 This black and red wool crepe appliqué jacket was designed by Lucien Lelong, but which actress wore it in 1947? 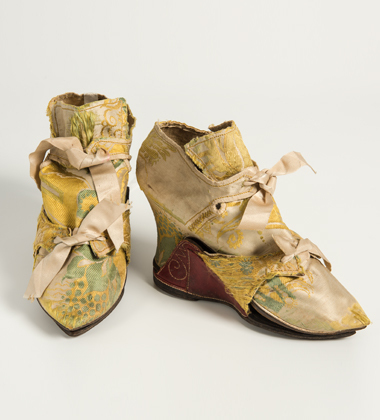 How old are these woven silk shoes with leather covered clogs? Oh dear. We'd recommend a trip to the Fashion Museum to blow away those cobwebs. Not too bad, but if you'd been to the Fashion Museum recently you'd probably have scored higher. You know your stuff, and why not visit the Fashion Museum to feed your knowledge? You know your stuff, why not visit the Fashion Museum to feed your knowledge? Now that's impressive! Plan your next visit to the Fashion Museum. Amazing result! To feed your fashion habit with a visit to the Fashion Museum. We're not worthy! Feed your fashion habit with a visit to the Fashion Museum. 1. The promoter is: Bath & North East Somerset Council acting by its Heritage Services section, whose principal place of business is The Pump Room, Stall Street, Bath, BA1 1LZ. 2. Employees of the Heritage Services section of Bath & North East Somerset Council or their family members or anyone else connected with the competition or helping to set up the competition shall not be permitted to enter the competition. 3. There is no competition entry fee and no purchase is necessary to enter this competition. Entrants must answer the questions online at www.fashionmuseum.co.uk/quiz. In order to be eligible to enter the prize draw, entrants must correctly answer at least a question. For each of their correct answers, the entrant will receive an entry into the prize draw once they have submitted their personal details. The closing date for the prize draw is 30th April 2016, any entries received after this data will not be included in the draw. Tickets to the Fashion Museum for 4 people valid until 15 March 2017. Driver must have a full UK licence and no convictions. Driver must be over the age of 21 years old. They will win the car for a weekend-Friday to Monday. They must be available to pick up and return the MINI from Wellsway MINI, Bath. Lower Bristol Road, Bath. BA2 3DR. If drivers are aged over 21 the insurance excess will be £750.00. If drivers are aged over 25 the insurance excess will be £500.00. Fuel will not be provided. 4. The promoter reserves the right to cancel or amend the competition and these terms and conditions without notice in the event of a catastrophe, war, civil or military disturbance, or any actual or anticipated breach of any applicable law or regulation or any other event outside of the promoter’s control. Any changes to the competition will be notified to entrants as soon as possible by the promoter. 5. The promoter is not responsible for inaccurate details supplied to any entrant by any third party connected with this competition. 6. No cash alternative to the prizes will be offered. The prizes are not transferable. Prizes are subject to availability and the promoter reserves the right to substitute any prize with another of equivalent value without giving notice. 7. The winners will be drawn at random from the successful entrants. 8. Winners will be announced via social media and contacted via email within 7 days of the competition ending. If the winner cannot be contacted or does not claim the prize within 14 days of notification, we reserve the right to withdraw the prize from the winner and pick a replacement winner. 9. The promoter will notify the winners when and where the prizes can be collected/or if they need to be posted. 10. The promoter’s decision in respect of all matters to do with the competition will be final and no correspondence will be entered into. 11. By entering this competition, an entrant is indicating his/her agreement to be bound by these terms and conditions. 12. The competition and these terms and conditions will be governed by English law and any disputes will be subject to the exclusive jurisdiction of the courts of England. 13. The winner agrees to the use of his/her name and image in any publicity material. Any personal data relating to the winner or any other entrants will be used solely in accordance with current UK data protection legislation and will not be disclosed to third parties beyond the organisers and affiliates without the entrant’s prior consent. 14. By submitting an entry into this competition, entrant consents to share their personal information with the promoters and affiliates, and may be contacted in the future via email. 15. Only one entry per person. Entries will be distinguished by email address. The promoters reserve the right to disqualify any entrants not meeting the above criteria, or if they have reasonable grounds to believe the entrant has entered their details fraudulently. Kindly supported by Wellsway MINI, Milsom Place, SouthGate, Laura Ashley and Jolly’s Bath.